a new implementation of the Python programming language running on .NET. It supports an interactive console with fully dynamic compilation. It is well integrated with the rest of the .NET Framework and makes all .NET libraries easily available to Python programmers, while maintaining full compatibility with the Python language. The cool thing about IronPthon is that it also works with the Windows Presentation Foundation which will be released when Windows Vista is released and available for Windows XP and Windows Vista. I thought that this was pretty interesting so I thought I’d try playing with it and write a quick tutorial. Once you have everything installed load up Microsoft Expression Interactive Designer (MEID from now on) or sparkle as it used to be called and close the Welcome Screen. You might notice that MEID is very slow, on my system the program just seems to c-r-a-w-l, but it does allow you to do some pretty neat things. After it has finished loading and clearing the Welcome screen you should be left with a blank canvas. The canvas is too large for the Hello World program we’re creating so resize the canvas until it has reached a suitable size. 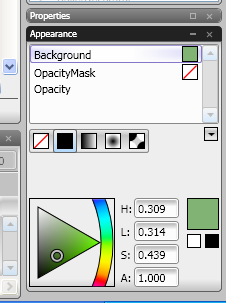 Then with the canvas selected, select the Background item in the Appearance pallet and set the background of the canvas (our window) to something suitable using the colour picker below. I selected a nice dark shade of green.